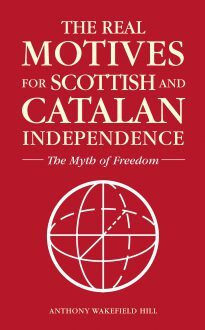 There is every reason to lump together the Scottish and Catalan attempts at independence, as will immediately be evident upon the reader’s acquaintance with this book. No doubt there are figures in Catalonia equivalent to Alex Salmond and Nicola Sturgeon, since pathological psychology is presumably not confined to the Scottish mentality. The body of the book is occupied by an analysis of the desire for Scottish independence, seen partly as a reflection of the American variety, but, to both of these the Catalonian call for a similar event can be likened, and therefore the author does not devote much time to the latter, incipient development. However, the reader is enjoined to substitute ‘Catalonian’ references for ‘Scottish’ references throughout.